It’s been said that most of major stock market gains happen on just a few fateful days of the year. Miss those few days and you’ll miss-out on most of the gains in the stock market that year. Hence the common advice to always stay invested in the market. Well, I happen to believe that real-life operates a bit like this too. Sudden big changes occur in life that happen extremely rapidly, followed by long periods of “sameness”. That “sameness” can go on for years and years, only to have life flipped upside down by rapid change in a matter of a few days. Followed by long periods of sameness again. August was one of those “big change” months for the Tako household. We finally changed-up our childcare situation in preparation for Tako Jr. starting school this fall, and the impact on our expenses was significant! 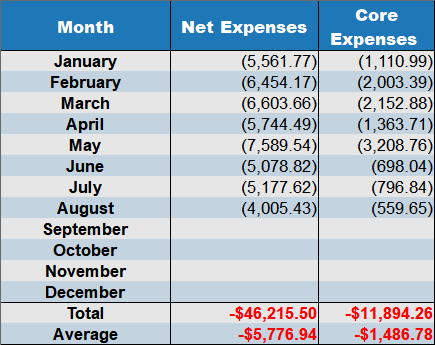 First off, let me state that I’m changing how I write this monthly financial update post. Instead of writing about dividends near the end of the post, I’ve decided to shuffle things around so the dividends happen at the start! 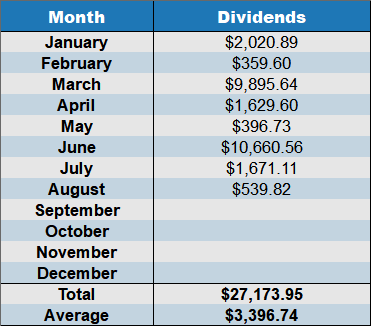 For the month of August, our dividends totaled $539. This is a rather small monthly sum, but please remember that most of our dividend payments happen in March, June, September, and December. Monthly dividend fluctuations like this are perfectly normal, and we make no attempt to “smooth out” these dividend amounts. Our focus is on holding the best investments that we can, so dividend income will always be a little lumpy. For the year (so far), we’ve received $27,173 in dividends. This is roughly on pace to reach our dividend income goal of $53k. While July was a big month of traveling for the Tako family, August turned out to be a quiet month at home. As you would expect, our monthly spending was low … really low actually! It was our cheapest month of the year, at $4005. 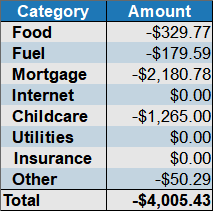 Core expenses (not including mortgage and childcare) were a mere $559 for the month. So exactly what did we do during this quiet August? Well, we tended the economic garden, spent a lot of time with the kids outside at our local parks, and just enjoyed the fruits of summer… (mostly zucchini). Food costs were $329 in August. Just like last month, our food expenses were significantly lower than average due to food production coming from our economic garden. We still had a TON of zucchini to eat! Even after putting zucchini into nearly every single meal in July, we still gave away a large amount of it to friends and family. Don’t fret though — I still incorporated it into our meals as often as possible. 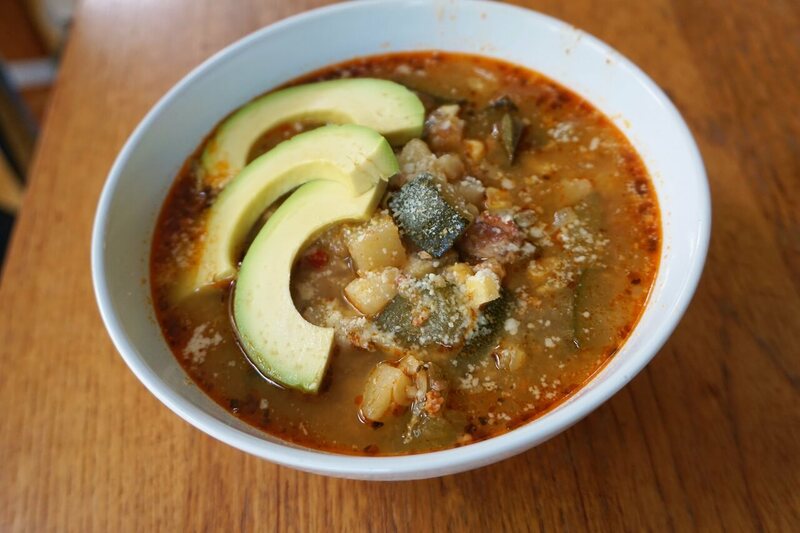 Zucchini chorizo soup. A tasty way to eat-up a little more zucchini. 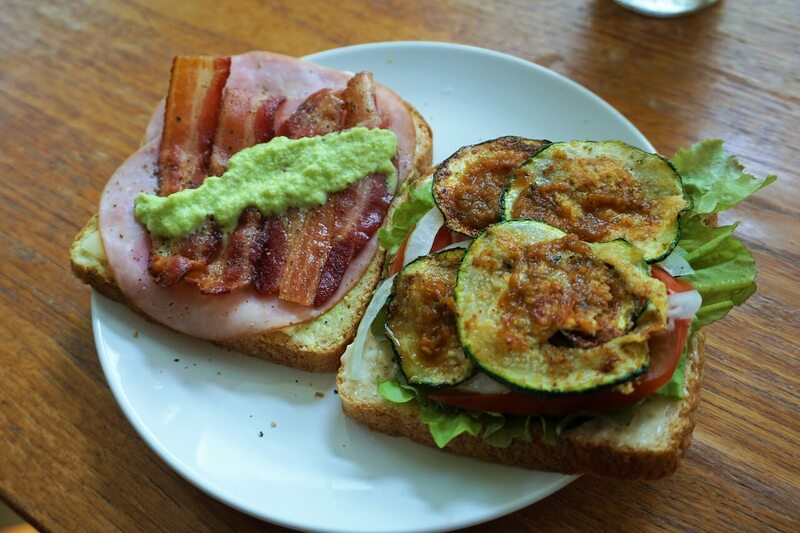 Bacon & ham sandwich with zucchini and jalapeno-garlic aioli sauce. Our local supermarket had a great sale on pork loin in August, so I decided to try my hand at making a classic Japanese dish called tonkatsu. Basically, it’s like a breaded and fried pork chop. It’s very popular in Japan, and when we visited Japan last year I must have eaten tonkatsu a dozen times. Even though I’ve eaten it many times, I’ve never actually tried cooking it. So, I gave it my best attempt and the results were pretty good. My first attempt at making tonkatsu. It was pretty good. I’ve definitely eaten better, and worse. Room for improvement I guess! I’ll definitely need more practice to get that perfectly crispy exterior and ultra juicy interior I’ve come to associate with “restaurant quality” tonkatsu. Mrs. Tako also made-up one of her Japanese favorites in August called okonomiyaki. This is another classic Japanese dish which originated in the Kansai region of Japan. 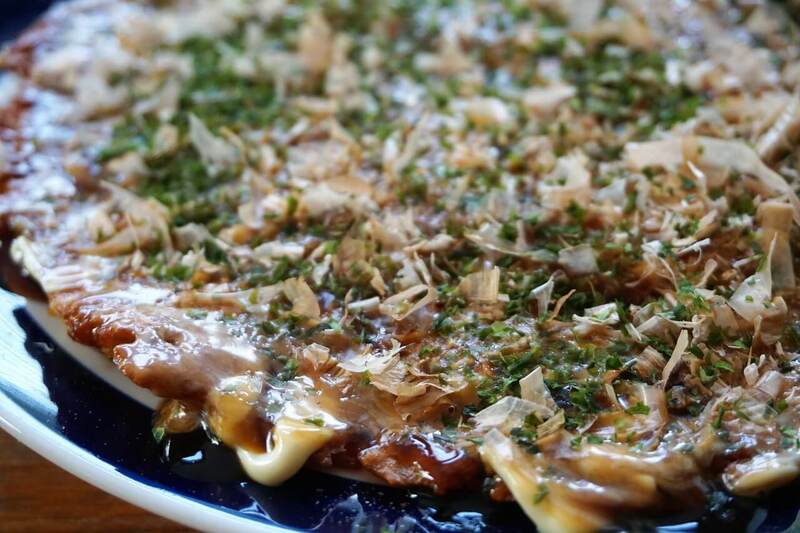 A close-up of a “fully dressed” plate of okonomiyaki. It may look strange with the tuna flakes, nori and mayo, but it’s extremely delicious! Fuel costs in August amounted to $179, which kept gas in our two cars. This monthly fuel amount is considerably higher than previous months, but we didn’t do any different driving. I attribute the change mostly to higher gas prices and the timing of fill-ups. Other than one short weekend road-trip, our driving level was pretty much the same as always. Internet expenses in August amounted to $0 … exactly like it was in June and July. Rest assured we still have very speedy internet service despite a non-existent bill. We prepaid our internet expenses back in May to reach a credit card sign-up rewards. Usually our monthly internet bill is $49.95, but we prepaid $500 toward the account. I don’t expect to see a real internet bill for a long time. Mortgage and childcare expenses are usually our biggest bills in any given month, and August was no exception. Our mortgage remained at $2,180, but the childcare situation changed dramatically. First off, we completely pulled Tako Jr. #1 out of his language immersion daycare program. He stayed home with me all month and we had a ton of fun hanging out together. This was sort of a last blast of 1 on 1 father-son time before he starts kindergarten. This alone would have saved us around $1000 a month, but we decided to move Tako Jr. #2 to attend full-time. (They were part-time before) The result was a monthly savings of around $900, and a total childcare bill of $1265. Oh, and Tako Jr. #1 starts kindergarten this Monday! This is going to be a HUGE life change for both of us! Not only does this mean I’ll have a lot more free time to do stuff during the day, but the impact on our monthly finances is going to be like a breath of fresh air. Finally! I don’t regret putting both kids into the language immersion program, but the additional financial freedom we’ll have with an extra $900 is BIG. Our total utility bill total for August was…. [drum roll please] Zero dollars! Yep, we had no utility bills to pay in August. Either we paid our bi-monthly utility bills in July or the amounts were prepaid earlier in the year to get those sweet credit card sign-up points. Other expenses in August amounted to $50. This amount includes one small expense ($8) from our July camping trip (which oddly wasn’t charged until August), a trip to Home Depot ($12) for home repair parts, and a few school supplies ordered from Amazon ($20). Our big “consumer purchase” for the month was a set of Uni Posca paint pens ($9) we ordered from Amazon. Yes, I said paint pens. Why do we need these fancy paint pens? To paint rocks of course! 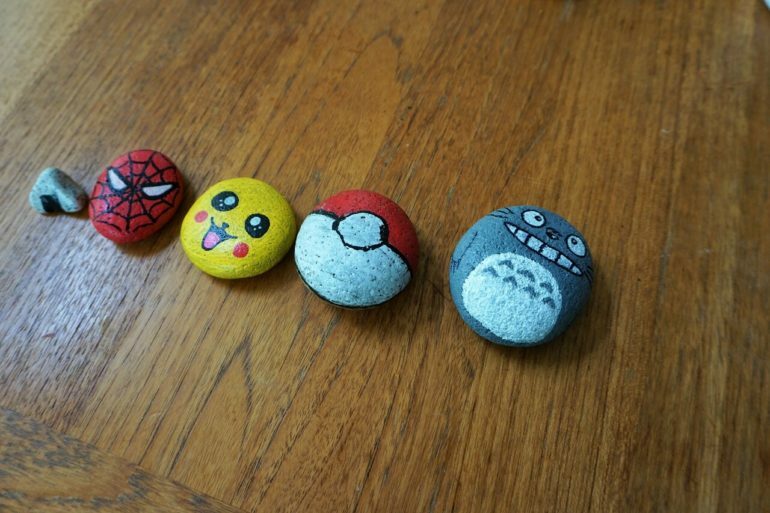 A sampling of our painted rocks — Onigiri, Spiderman, Pikachu, a Pokemon ball, and Totoro. Usually I raise an eyebrow about frivolous spending, but Mrs. Tako and the kids had a really fun time painting all kinds of rocks around the house. I was pretty impressed by the results too. Normally those Uni Posca paint pens sell for $23, but through a series of earned coupons and Amazon promotions I was able to get the price down to a mere $9. Not too shabby. I can handle $9 of frivolous spending in a month. For the year so far, the Tako family’s expenses have reached $46,215. This is around $700 less than we spent by this time last year, so I feel pretty confident about our 2018 spending level. With Tako Jr. attending kindergarten very soon, our expenses should remain low for the rest of the year. Before you make fun of my large expenses, please remember that we live in a very expensive part of the Pacific Northwest. We do our best to be frugal, but it’s definitely not cheap here! In keeping with my tradition investment updates, August contained no changes to our portfolio. Yep, nothing changed! 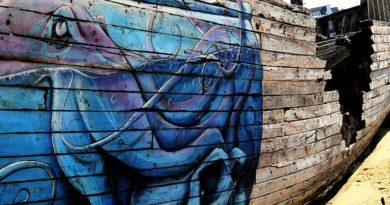 Although I continued searching for new investing ideas in August, nothing really “struck a chord” enough that I wanted to plunk down a pile of cash. I actually came pretty close to buying a little more LYB, but share prices remained stubbornly high. It didn’t happen. Unfortunately this means our portfolio remains at roughly 20% in cash. Yes, this is considerably more cash than I prefer to keep around, but Mr. Market isn’t providing me “business-like” deals that make a lot of sense right now. Everywhere I turn I see speculation and extreme optimism about the future when investors are buying into stocks at these levels. This makes no sense to me. Investors seem to be willing to pay 25 times earnings just to own the S&P 500. That feels like unbridled optimism! Is the future really going to be much more awesome than today? If we compare to a time period in American history that had low interest rates similar to today (the 1950’s), PE levels were in the 10 to 15 range. That’s a lot lower than where we are in 2018, but we can’t just look at PE’s and interest rates alone… we have to also consider growth. When you’re paying a PE of 25 you’re mostly paying for future returns, not current returns. Growth is hugely important at these levels. So how much growth can we look forward to? It’s a difficult question to answer (because I can’t predict the future), but historically GDP growth rates averaged 4.36% through the 1950’s. Those growth numbers are nearly double this decades GDP growth numbers (between 1% and 2.89%). And yet, PE levels were half as high in the 1950’s. I find these facts concerning, and it’s one of the reasons why you won’t find me overpaying for growth right now. This doesn’t mean I recommend everyone else keep 20% in cash, but it’s the situation I find myself in today. Nice low spending month… and where do you find these endless unique cephalopod pics? Thanks Accidental FIRE. The internet definitely loves octopus photos, but the hard part is finding ones with the right license I can use for the website. I think I like the new format with the dividends at the start. I used to keep wondering about them and it’d take my attention away a bit from the more narrative commentary that preceded. I prefer “fruits of summer” to be a purely figurative phrase describing fun and awesome activities. I most certainly do not approve of zucchini’s inclusion. 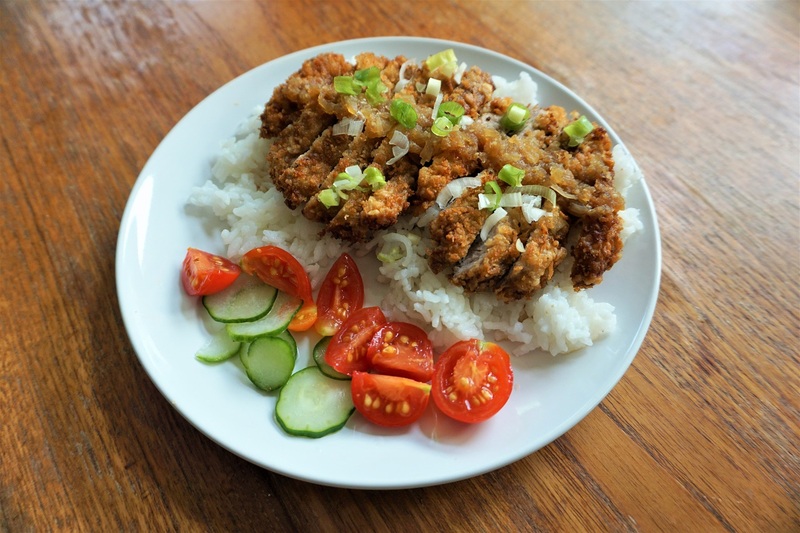 The tonkatsu looks good – what kept it from awesomeness? My better half makes great tonkatsu but my knowledge / role is limited to smashing the meat with a mallet as prep. Perhaps you and she can compare recipes. And congrats and good luck to Tako Jr. 1 entering the big leagues! My disappointment with the tonkotsu stemmed from it’s lack of juiciness. I’ve had some very good tonkatsu over the years and it’s always got that juicy flavor inside. Maybe Mrs. Paul can give me some tips. Thanks for the feedback on the post btw! 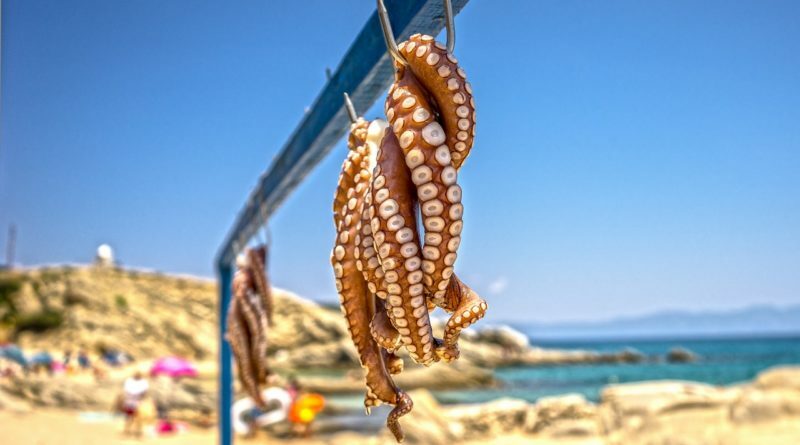 Glad to hear that you will have a big dip in expenses with Tako Jr. heading to school. My daughter was just born a few weeks ago so we are looking at some pricey years of daycare ahead if Mrs. Financial Verdict decides to go back to work after her maternity leave ends. 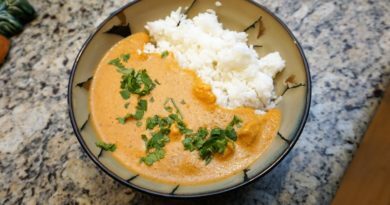 Thanks for your thoughtful comments on current PE ratios and description of some of the interesting things you enjoyed eating last month. Some really good looking things that I am not familiar with and will have to check out! I wish that we had the credit card points bonanza that the US does. Here in Australia the benefits of points aren’t nearly as good. 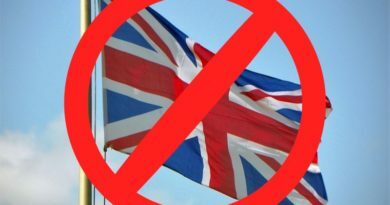 Yup, I’ve heard that same lamentation from Canadians as well. Perhaps there’s just more competition for credit card “customers” here. The food pics look great. I’ve always thought an okonomiyaki restaurant would be a big hit in the PNW. It’s warm inside and you can drink and socialize. That’s perfect for the rainy weather here. I’m surprised there isn’t one in Portland yet. I hope kindergarten is going well. It was a big financial relief for us when RB40Jr finally started public school. Yeah, I’m surprised too. Korean BBQ goes over pretty well here, so why wouldn’t okonomiyaki? Perhaps it’s just a little too foreign. Thanks for the best wishes on kindergarten! I’ll let you know how it goes. Do you make a distinction between dividends in your retirement accounts and that in taxable accounts? I separate those into two categories when I calculate my passive income. I figure it’s a smart way to do it because when I retire early I won’t be able to tap the retirement one until standard retirement age. I only report the dividends in our taxable accounts. Any dividends in our retirement accounts are not reported here because we simply don’t draw on our tax advantaged retirement accounts. Congrats on Tako Jr. #1 starting kindergarten! I can’t wait until Baby F1 goes to kindergarten for free at age 5! Like, can it start any sooner? Yeah, school supplies were not that much. Less than $50 in total. While we still have his lunch expense to bear, that’s pretty minor compared to $1,000 per month. And you did have that phenomenal $1k in one month so it evens out . To be honest I’ve been guilty of yield chasing and paid a pretty price so I’ll be holding for a long long time. Thanks for your comments Financial Orchid. I strongly recommend against chasing high yield. It was once a game I played, but rarely did it ever work out for me in the past. BTW, how do you hold your 20% cash? In an MMA? Or, something else? Anyhow you’re on the list of my blogs now, nice to meet you! Looking at your expenses, I don’t see any medical expenses/insurance costs. Do you use your spouse’s work medical benefits? If so, have you performed a cost analysis of how much medical expenses would be incurred if your spouse retired? Yeah, the family is covered under Mrs. Tako’s medical benefits for now. We’re pretty healthy, so mostly that amounts to $0 every month. And yes, I’ve done an analysis of medical insurance costs in the past (here). Since then, we’ve decide we’ll probably go with a Liberty Healthshare plan. So, any kind of insurance plan will be in the neighborhood of $400-$500 per month. If I pretended to be lower income I think I could easily qualify for bigger ACA subsidies too. Our home insurance is wrapped into our mortgage amount every month, and our car insurance is billed once a year. Two more years for us until kindergarten! Even only paying for part time preschool that change is going to be SIGNIFICANT. Yup! It makes a big difference (if my own finances are any indication)! A lower dividend income than usual but still pretty good (not $0 🙂 ). Man your food pics look pretty good, maybe I should invite you guys up to cook for us. Hehe. Baby T1.0 started kindergarten this year too. Exciting times for sure. Yup, it wasn’t really a big dividend month… but I don’t worry about it. Next month (Sept) will be a lot better. Great reading as always. For your 20% in cash, what is your savings strategy? Are you reaping additional dividend benefits from that cash? Completely agree there is no reason to overspend on an investment, but I wonder if there’s a tipping point where an investment which is slightly overpriced has a dividend return greater than keeping cash liquid? That being said, I really appreciate your discipline and cautiousness in investing. No reason to push for more returns at a risk when you’re already achieving your goals! Mostly the cash sits in a money market fund… waiting. But it also earns a little interest. Protecting wealth is almost as important as growing it, IMHO. Another great month. We can’t keep our core expenditures that low, as we made a decision that we do have to fund some hobbies and the like. Also we have to cover medical expenses every month which is close to $1000. It seems like your trying to say we don’t have hobbies… which is ridiculous. We have plenty of hobbies! One of the first posts I ever wrote on this site was about hobbies. We simply find ways to engage in our hobbies such that they don’t cost a lot of money (or better yet, they pay for themselves). We’re pretty healthy, so medical costs are minimal. Okonomiyaki looks yums! What I wouldn’t do to pry under a woodfloor plank and sneaking food through tha….is that odd to say? I’m always nervous and retract any investment statement but I’ve been telling hubby to increase our cash reserves but he doesn’t want to time anything. Aack such indecision. For investments, I honestly think we should separate some of that out because this part we don’t usually agree on. He’s not big on dividends either. There more I’m learning, the more I’m realizing why there are so many factions! Came over for the food pics of course (oh, Totoro is so cute too). Zucchini chorizo soup FTW. I will need to try that one out. Yum on the okonomiyaki and your tonkatsu looks delish. Thanks for sharing your expenses. With the exception of the normal big ones – mortgage and childcare – it’s neat to see how low you keep the remaining expense categories.